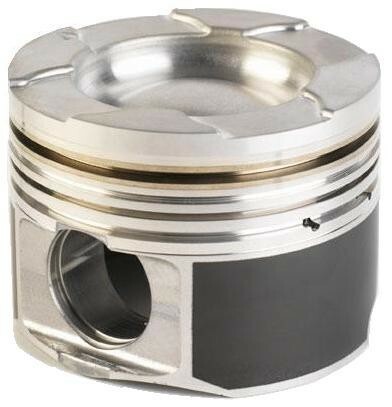 Compared to the LB7, and depending on the final bowl configuration, the Motorsport cast piston can be made with a 15% thicker crown, 20% more material between the bowl and the gallery, and almost 30% more material in the cross section below the pin bore (adding more inertial strength for high rpm). But the biggest advantage is the ability to dictate the bowl design without being constrained by the parameters of a pre-cut stock bowl. Again looking at the stock LB7 for comparison: Stock bowl = 38.1cc for 17.5:1 compression ratio (CR) A delipped stock bowl increases volume to 40.8cc and drops compression to 16.7 With the addition of 0.075" valve pockets, volume increases to 45.5cc and compression drops to 15.4 With the Motorsport cast piston, we can alter the bowl shape and still maintain any target CR. Off the shelf, there's a 16.8:1 version that's fully delipped but also has a wider bowl diameter than the stock delipped piston. The 16.5 version has 0.075" valve pockets and maintains the same diameter as the delipped stock piston (actually +1mm) without sacrificing the compression. There's also private label versions of these pistons available with bowls that will range anywhere from 17.0 to 15.5. Custom configurations can be made with the usual stipulation that they'll cost more and take time to make.